Our dogs live in our homes as beloved family members or in loving Guardian Homes. The adult dogs play an important role in socializing puppies and teaching them canine "Good Manners," while the human family members devote countless hours to individualized puppy care. Puppies are whelped and brought up at the center of our household--not in a kennel or back room--which provides them with the best opportunity to experience the sights, sounds, and smells of a busy household and ensures that they receive plenty of attention and oversight throughout their various developmental phases. Puppies are exposed to a variety of different stimuli including vacuum cleaners, car rides, a cat, chickens, annoying pop music, unusual culinary aromas, an excess of televised sporting events, and the bagpipes! While we are extremely careful about keeping young puppies protected from disease and from stress, we try to expose the puppies to a variety of humans throughout their lives with us. While we appreciate good-looks as much as the next person, temperament and sound health are the key factors behind breeding quality Labradoodles. Can you judge a book by its cover? 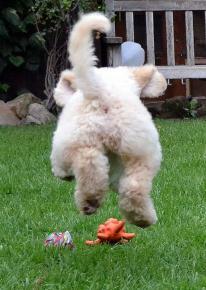 We evaluate our puppies' personalities extensively and focus on achieving the optimal match between puppy and family. Have questions about how to manage your new family member? Need advice on food or training? Referral to a vet or groomer? Or would you like a lesson on grooming your dog? Vacation boarding for your new puppy? 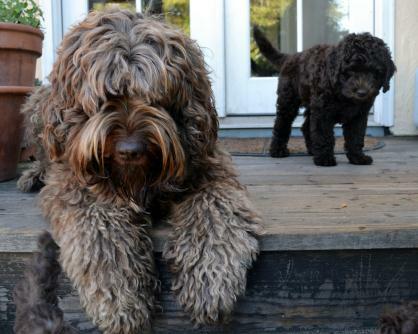 We are committed to providing assistance to our Labradoodle community throughout the life of the dog.